What a fun filled week we had! Happy Friday! These were really easy to make. I just laid down a piece of contact paper on our counter, gave Sweet Girl green tissue paper and glitter and let her go at it! Once she was done, I covered it with another piece of contact paper and then cut out shamrock shapes!! I love having these sun catchers in our kitchen window!! We used yellow and blue paint to make green shamrocks. Sweet Girl didn't get the whole "color mixing" thing, but did enjoy getting all dirty! This would be a great activity for teaching color blending to older children! This took FOREVER to make. First we had to sort our cheerios by colors, then glue them onto the rainbow (I did that part...Sweet Girl lost interest after the sorting). Then we took a little break for a while and came back to add the pot of gold, clouds and sun. Sweet Girl insisted it had to have a sunshine!! We made shamrocks out of heart shapes. Then Sweet Girl used her watercolors to paint the page (watercolors are her absolute favorite!!). Sweet Girl loved this one because it involved glue and feathers. Warning, though....cutting out the letter F made quite a mess. There were feathers everywhere!! 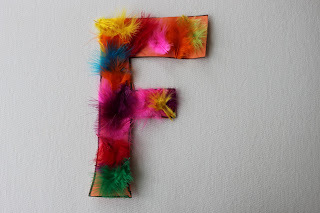 I saw this neat idea over at Frugal Family Fun and thought it would be great for our letter F week. As you can see we made three flowers and then Sweet Girl decided to add her artistic touch! What did you do this week??? Hi, I found your blog from Preschool Corner. Cute crafts! I'm enjoying your blog. 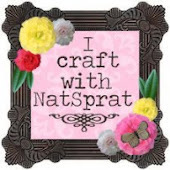 I love hopping around and seeing what great crafts and activities others are doing with their little ones. I would like it you would follow me back. I love that rainbow, why didn't I think about that!!! very nice crafts you have, thank you! I also teach my girls at home. I love all your crafts! I love the F in feathers! So cute! Lots of fun ideas! 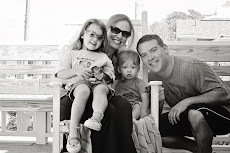 Thanks again for linking up with For the Kids Fridays! Hope to have you back this week!